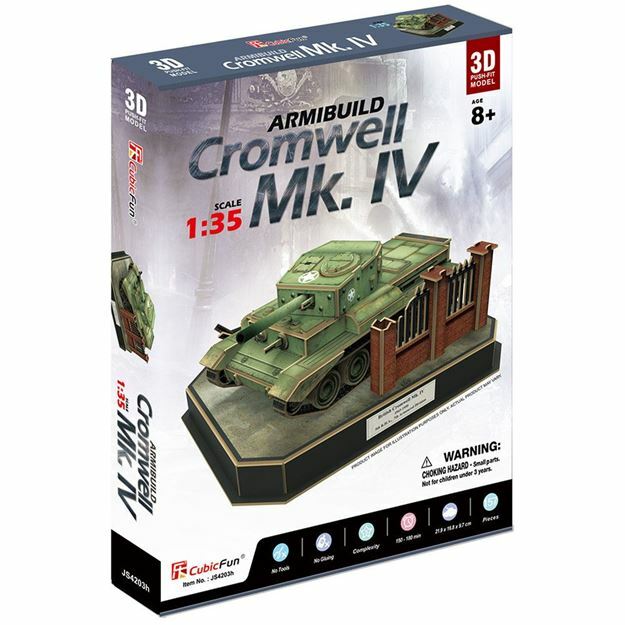 Named after the English Civil War leader, Oliver Cromwell, the tank proved to be an adept and rugged fighting machine and served until the end of the War. At the beginning of the Second World War in Britian, the British had a strongly armored tank, which was very slow and unable to fight against most German tanks. Very quickly, the British began work to develop a new tank, which was more mobile. Thus was born the Cromwell tank, whose production began in 1942. While out-gunned and out-armoured by German tanks, the Cromwell managed to hold its own through better manoeuvrability, due to its relatively small size and reliability in combat, something which was lacking in German armour. This 3D Puzzle is made of paper and expandable polystyrene foam board, it is easy to assemble without the use of any other tools or glue. No of Pieces: 157 Model Size: 21.9cm x 16.8cm x 9.7cm. Age: 8+ years.